The Daily Draw: 11/11/13—Quitting Smoking. And All Other Kinds of Stuff. 11/11/13—Quitting Smoking. And All Other Kinds of Stuff. 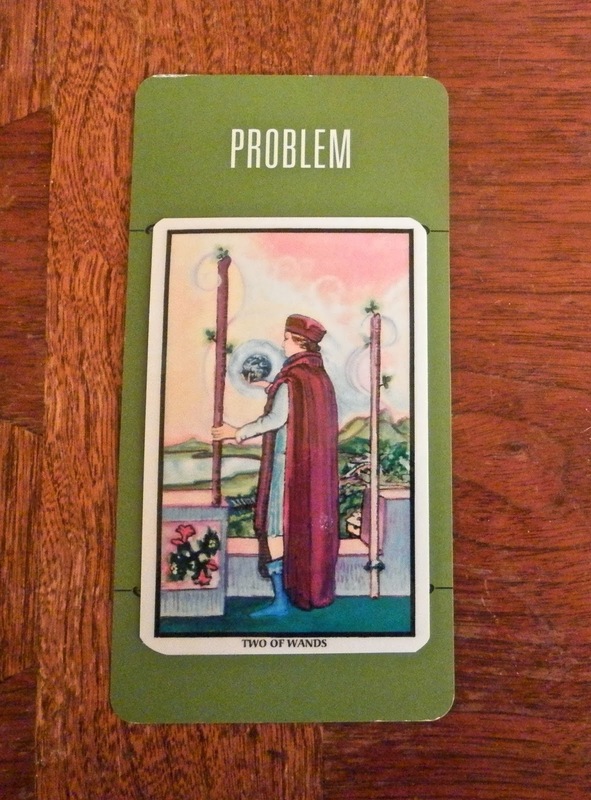 Today's Draw: Two of Wands in the Problem position from the Illuminated Tarot by Carol Herzer and the Deck of 1000 Spreads. Are you struggling with some change in your life? Why haven't you made your decision yet? Why do you choose to plant your feet in two different worlds? November 2nd was the 10th anniversary of me quitting smoking cigarettes. It's something that's really big for me. I tried and failed to quit for about 10 years prior to finally quitting. Nicotine is neck and neck with crack cocaine as the second most addictive substance known to man. Heroin is the most addictive. I think a lot of people, including former smokers, don't acknowledge it as a drug addiction like any other, but it is. Quitting smoking won't kill you. You may want to be dead in the first few months...haha...but the action of quitting won't kill you like it can for alcohol and heroin, for example. Of course, not quitting WILL kill you. One in five deaths in America is caused by smoking. I say all of this, because it is one of the things I'm most proud of in my life. Some people (very few) just put the cigarettes down and never go back. They quit their first time. Most of us, though, struggle and hate ourselves for not being able to quit. For me, it was important for me to understand that I was a drug addict and just because my drug was legal didn't make it less seedy and pathetic. The fact is that I was a junkie that needed to administer my drug about 40 times a day (I smoked two packs a day). If I were to say what worked for me, using nicotine replacement (gum, patch or lozenges) as directed on the package helped. So did joining a virtual community called quitnet.com. Realizing that I was a drug addict and all that goes with that helped a lot. And giving myself a realistic timeframe to be "out of the woods" was also key. It takes about a year before you can relax. Prior to a year, feeling confident about your quit is your best indication that you're on the verge of relapse. You have to remain vigilant. But the #1 thing that helped me quit for good is why we're here today. 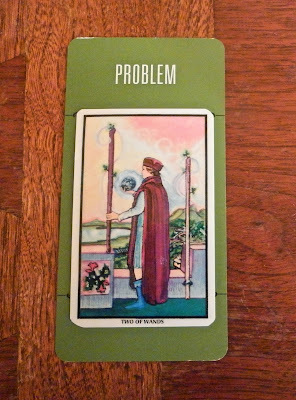 The Two of Wands can be a card of decision-making and taking charge of a situation. So the combo is saying that decision-making is the problem—the problem to my weight loss issues, her job search, his marital issues, their search for change. The #1 thing that helped me quit smoking was a decision. Not a decision to quit, rather a decision to never smoke again. There's a difference. Deciding to quit is something too easily undone by a crazed junkie mind. In the midst of a craving you'll find yourself saying, "I decided to quit and now I'm going to decide to smoke, then I will decide to quit again." Something about "never smoke again" makes it final and inarguable. That's the way you have to be when it comes to addiction. You have to close all doors to the possibility that you will ever smoke again. It makes letting go much easier. It also miraculously made it easy for me to quit. Anytime we have one foot in one world and another foot in another, we have conflict in the mind. Do I stay or do I say goodbye? And this conflict causes us emotional pain as we bounce back and forth. The only thing that relieves the pain (other than heroin) is making a final decision and moving forward with it. When you make the final decision, then holding on to the other thing ceases to be an option. And when holding on to the other thing ceases to be an option, it no longer causes pain and it no longer holds you back from moving forward. This combo came to us to consider this week, "what decision have you not yet made that needs to be made?" And when you figure that out, the next question becomes, "what are you going to do about it?" See, what we don't realize until we let go is that it's the holding on that causes the pain and difficulty. Most of the time we already know what decision we're going to make and we're just afraid to make it. When I quit smoking, I made the decision a week before I quit. I gave myself a week to smoke as much as I wanted while I dealt with the anxiety of "never again". Then, after 26 years, I turned and walked away. For any smokers out there, most quitters will relapse in the first year. After two years, your chances of relapse dramatically reduce. It sounds daunting, but plan on it taking an entire year for serious cravings to stop. Like I said, thinking you're out of the woods is what the junkie inside you wants you to think. It wants you to get cocky enough to think you can have a cigarette. Addicts can NEVER smoke again. And chances are if you smoke, you're an addict. Additionally, don't fixate on cravings. Distract yourself. They go away. Your second year will be very easy, but do remain vigilant. Something happens inside you in that second year that dramatically increases your ability to stay quit for good. I used to think I would always miss smoking and that I would have to white knuckle my way through the rest of my life. But that's not the way it is. I'm free. I don't even think about it. It's like some other creature smoked two packs a day for 26 years, not me. The smoker thing is "if I'm given a month to live, I get to smoke". Well, that's not a contingency of "never again". And if I were given a month to live, I wouldn't even be tempted. I'm free. And you can be too. I never lose sight of the fact that I'm still an addict and that even a single puff can endanger my smobriety (yeah, that's what they call it..haha). But I'm free. And I'm really damn proud of that. Quitting smoking was something I kept putting off. It took a heart attack to help make the decision for me. I didn't know you had a heart attack, Michael. What a horrifying experience to survive! I know I was constantly afraid of having a stroke when I smoked. I had quit earlier in the year I quit for good...for five months. During the five or six months between the quits, it weighed especially heavily on me. In maybe September or October that year I awoke in the middle of night with the worst headache I'd ever had (and I'm someone who rarely even gets headaches at all) and I looked out my window and saw an ambulance loading what was clearly a dead body into the back just a few houses down from me. And that was a last straw. From that time on, I was on a count-down to quitting forever. I never knew what that man died of. He wasn't very old. But I told myself he died of a stroke from smoking and I was next if I didn't quit.